There is an odd balancing act specific to game stores in which customer satisfaction vies with retailer profitability. This is unlike other retailer relationships because game trade retailers often see product as a function of service. Most game trade retailers know nothing about retail and a tremendous amount about event management. They are party planners with gift shops for the most part. When Wizards of the Coast marketing asks us about our customers, they say players, because to them, we are in the business of "butts in seats." This model is a teeter totter, in which retailer profitability decreases as we give in to perverse pressures demanding customer satisfaction. A great store will have strong customer satisfaction and profitability, and we're not talking about that. This is a model of a broken store and in many cases a broken community, where selling things profitably and running events is simply not enough for the customer base. They demand more, be it even lower prices or free or close to free events. Let's take a look at each side. On the retailer profitability side, the downward pressures on top result in decisions leading to higher profitability. Rising costs often result in higher prices or at least holding the line on prices. Labor, for example, is rising in many states with increased minimum wage and the decrease in Magic margins results in many stores increasing box prices and event prices (you would hope). These things are seen as greed to customers, thus the same activity in green for retailers is seen differently, in red, by customers. If you ever hear a customer talking about prices over MSRP, it's likely they are comparing online. On the bottom of that retailer model are reasons why profitability declines because of retailer decisions, often with the goal of increasing customer satisfaction. There is a certain level of holding the line or even reducing costs to attempt to delight customers. Most weekly Magic events, I guarantee you, are poor margin events designed more as customer appreciation than profitable endeavors. That these weekly events have been declining in many markets means even this is not enough. Our Friday Night Magic is in the 25% range and even that decrease in margin isn't enough to attract large crowds anymore. I know there are areas of my store where I keep prices low to attract customers, such as card supplies. Some of these customers I know only buy supplies from me and buy their main game online, so I want something from them. Also on the bottom tier are the monastic sycophants, the retailers who claim they are there to serve the community, like some monk choosing a vow of poverty, so some 20 year old dude can have a place to play Magic the Gathering. We are about the people man! I know I won't be insulting them because they're off on a Magic blog learning about some new mechanic and could care less about business. On the customer side, on the top, we have pressures that push down profitability in exchange for customer satisfaction. Unrealistic expectations are what we get with the likes of Amazon, which has a net profit margin of around 2%, when it makes any money at all. Take your current personal income and divide it by three and ask yourself if you would still go to work today. That's how much you're asking retailers to earn in their business, selling games and running events for customers. Customers come in truly believing and spouting their truth that the Amazon price is the price. Retailers may not set their prices at this unrealistic level, but the pressure means they're certainly not likely to exceed it. Thus happiness is decreased and retailers look for other ways to make customers happy, like low margin Magic events and a store clogged with D&D customers who buy their books on Amazon at wholesale. Retailers are increasingly looking for ways to turn their retail environments into service environments due to this pressure and many of my retailer friends can't move to this model quick enough. Retailers call most behaviors related to unrealistic expectations entitlement, but as capitalists we see this for what it is. A large, multinational corporation is using retail as a loss leader to dominate market share while propping it up with outside services all backed by Wall Street against Main Street. Brilliant! Unbeatable! Customers on that march care nothing about the realities of rising wages and decreasing margins. When your store closes as you accept their entitlement, they'll rattle the door once or twice and drive across town. Your store closing will be the topic of conversation at the pauper event, for at least five minutes. For the entitled, the struggle about income inequality, higher wages and a strong middle class is a personal challenge, not something out there. It took a couple minutes to think of examples in which customers improve store profitability through their actions, but they exist. Only 20% of our customers use our very expensive game space, but when I polled customers, 80% of them buy in our store because we support the gaming community by having space. I was blunt in these conversations and many said they wouldn't shop if we didn't have it, even though it didn't benefit them directly. Community support is a very real, and irritatingly intangible force, keeping stores in business. It lives in a strange psychological limbo where "word of mouth" and the shifting demands of tween girls resides. Blind loyalty is on the dark side of community support. These customers will support a store because Bob is really trying. Loyalists spread their money around to every store in town because they want a vibrant, diverse community, rather than voting with their wallet for the best store. 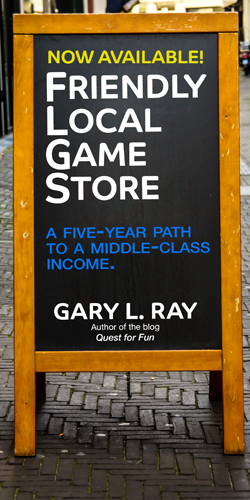 As store owners, we're in this death match of competition, working hard to delight customers in the face of rising costs, yet there are customers who won't reward our efforts, embracing a kind of game store socialism. The blind loyalists are a small crowd that can't be cracked, although I certainly try.